But let’s mount that same server in a file manager like Gnome File for example. The process is very simple. From the File menu, click on Connect to Server and a popup will appear. 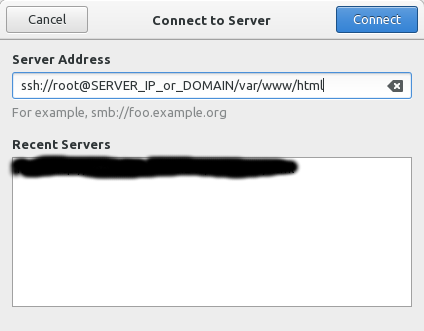 SERVER_IP_or_DOMAIN = ip or domain to connect to. /var/www/html = is the directory to load. Skip this if don’t want to set a default directory. It will ask for the password, enter the password for the user mentioned in the command.